Last winter I was surfing around on the internet and stumbled upon this recipe. I had many a daydream about cherry season and making it. I was not disappointed. I’m super excited to share this salad recipe with you because it’s so delicious and has an amazing combination of flavors and textures that make it unique. The combination of sweet cherries, slightly bitter parsley and roasted walnuts, dressed with tart lemon and pomegranate is so delicious and perfectly nourishing for the heat of summer. Cherries are warm, sweet, strengthen digestion and are deeply nourishing to the body. They contain B vitamins, beta-carotene, calcium and iron. Cherries are well known for being anti-inflammatory. Parsley is warming, slightly bitter and sweet. Parsley helps stimulate the digestive juices and removes congestion in the digestive system and tissues of the body. Walnuts are sweet and neutral to the body. They are nourishing, filling nad help preserve brain function. Lemon and pomegranate are cooling, sweet and sour in taste. They help preserve fluids in the body in the heat of the summer. Together, these foods are supportive to digestion and help the body relax in the heat of the summer and preserve nourishing fluids, while removing fluids that congest the skin and body tissue. Most importantly, this salad is delicious! 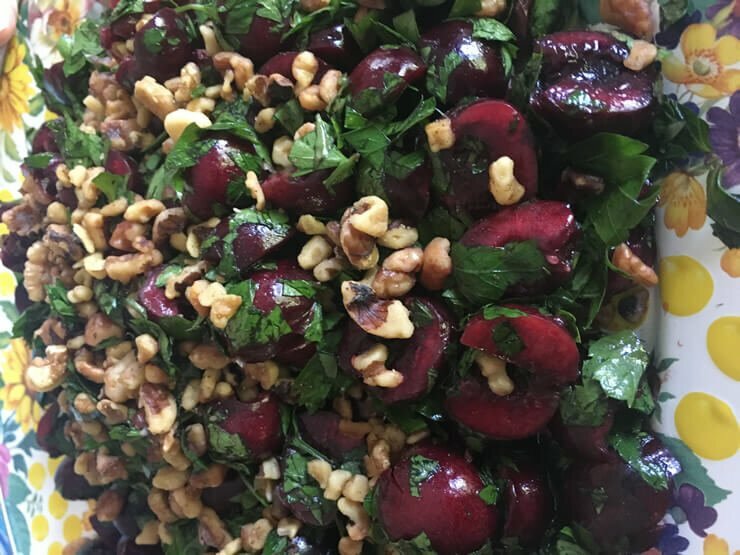 In a bowl, combine the cherries, walnuts and parsley. In a small bowl, whisk together the lemon juice, pomegranate molasses and olive oil. Pour the dressing over the salad and lightly toss together. Transfer the salad to a lovely dish and serve. You may want to try variations to this salad, like adding some mint or using pistachios instead of walnuts to try another flavor variation. Please, if you don’t already have a cherry pitter, invest in one. Don’t learn the hard way, like I did, how incredibly tedious it is to halve and remove the cherry pits with a small knife. It takes an incredibly long time, and no amount of your favorite tunes or podcasts will make it any better. You may also want to wear some disposable gloves to protect your hands from being stained with cherry juice. Seriously people, make this dish! You will be so happy you did and so will the people you share it with.